BPMInstitute.org has been publishing focused business process management content, including articles, research and webcasts since 2003. There's a wealth of information in our resources section. We recommend browsing the BPM topical resources section. Access the industry’s best training on BPM disciplines and methodologies with the flexibility to learn on your terms. Take a single course to enhance your skills, become a member for discounts on training and events, or become a BPMP by earning your BPM Certificate. You have the flexibility to select On-Demand courses, attend Live Online courses, or attend upcoming BrainStorm Events in a nearby city. Whatever training you’re looking for, we deliver what you want exactly how you want it. When you start your BPM career, you need specific skills training to effectively implement BPM solutions. 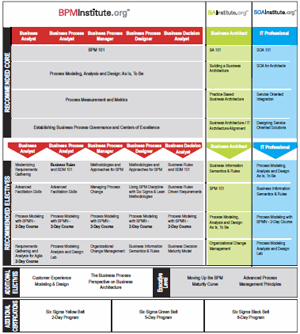 When you complete our eight-course curriculum, you earn a BPM Certificate - our in-depth training program that provides comprehensive education for strategic problem solving. To get started, take the BPM Skills Self-Assessment to identify your strengths and weaknesses across six critical Practice Areas. You can also use our Learning Paths Guide to select the courses that are right for your career path and BPM job responsibilities. If you plan to take more than two or three courses, we suggest you pre-purchase the eight-course requirement to earn your BPM Certificate Program to save more than $2,000. Professional Membership is included for two years. If you want to take a few courses first, you can apply the courses you've taken towards the cost of the BPM Certificate at a later date.